One of my goals for this year is to really make all those little things matter. I want to get over the hustle and bustle of the holidays and really simplify my life down to those few things that really are the most important. Right now I feel like my life is a mess. I’m still recovering from being on vacation, and we are trying to get back to our normal schedules. Today I feel like everything in my life is half done. My house is half clean, my Christmas decorations are half up, half my dishes are dirty. My life is only half back on schedule, and it’s killing me. Particularly Creamie’s sleeping schedule. She’ll take a nap just fine, but bedtime? Bedtime is a completely different story. I put her in bed at 8:30 last night and at 11:30 pm she was still awake. Happy, thankfully, and totally awake. This is day four of this late night being awake thing, and it is driving me absolutely crazy. While she is awake, I really want her to be the center of my life. I only get each day with her once, and I don’t want to waste time on something meaningless. There are so many things I want to teach her, and so many things she can learn. She’s only going to be little once, and I want to make the most of it. Because these days aren’t going to come back, and I don’t want to look back on them and regret how I spent this very small and precious amount of time. I’m not going to stop blogging, or stop sewing, or making things. I’ve always done all of my projects while she was asleep anyway. And I need that time for myself so I can wake up each day and teach Creamie how to sweep and mop or clean bathrooms. But I am going to reorganize some other aspects of my life so that while she is awake I really do focus on teaching her how to learn, teaching her how to be curious about something, teaching her how to contribute to our family, teaching her how to play. Because those are the things that really matter. We took her sledding a little while ago and she was in absolute heaven. It was a LOT of work, just getting her dressed to be outside was a lot of work. But that little squeal coming from the small person in front of me as we flew down the hill is what makes it all worth it. And clearly I’ve got to make her play hard enough that she’ll fall asleep before me at night. 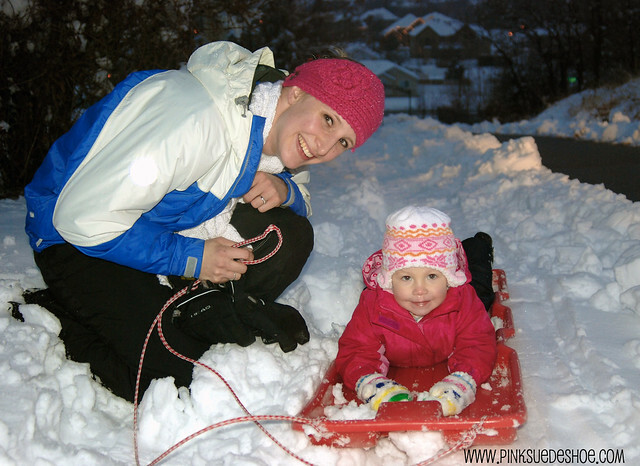 Maybe if I make her pull me up the hill on the sled she’ll be tired enough to go to sleep? I’m trying it. Seriously. You are so great to that girl and it shows! I’m still trying to not to compare my (unborn) children to her because she’s pretty much the most amazing and intelligent child I’ve met. And I’m pretty sure it has everything to do with the quality time, love, and attention you give her. What a great philosophy. I regret that I wasn’t able to stay home with my daughter when she was young. I was in school for 2 years and have worked full-time since. She’s now 18, and I wish more than anything that I could have some of those days back to focus in the really important things – not my job or the cleanliness of my house, but that amazing little creature that I made! You are such an amazing mom! Lucky Creamie! You might want/need to start cutting back on the nap time in order to get her to sleep earlier. Good luck with that! Dah, she’s cute. And red sled’s look really good on you both. Your pictures speak volumes to the incredible relationship you have with your precious daughter. Make her pull you up the hill and fall asleep already. Seriously, I’m thinking she may be outgrowing her nap (sorry to say). Been there (eons ago), it’s a tough adjustment for everyone!